Waking up in our little oasis here in Niagara Falls was heaven…especially when we got breakfast in bed! Well, we did not exactly eat it in bed, but the Sterling Inn and Spa has a neat little perk. 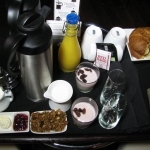 Breakfast is included in your stay, but in lieu of having to get dressed and ready and go eat in a breakfast area, they bring a beautiful breakfast tray to your room! There is a card to fill out that you hang on your door each evening with your desired time and a place to check off your preferences. And voila…your breakfast comes to you. We loved eating in our jammies! The breakfast includes yogurt and fruit parfaits with house-made granola, fresh croissant with whipped butter and house-made jams, a coffee cake, fresh fruit, and tea or French pressed coffee. A wonderful, leisurely start to the day! Rhonda, the hotel’s marketing director, met us in the lobby to chat with us about the history of the hotel. 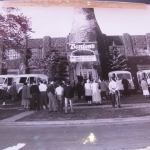 The was originally the home of Cairn’s Dairy in 1928, and its landmark feature was and still is a three-story milk bottle entrance. 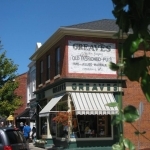 This remained a dairy for over 50 years, and served as a restaurant for a few years. In 2005 a vision for a boutique hotel took shape, and the present Sterling Inn and Spa were started. The features we love about this hotel are the exposed beams and places where the original flooring in still exposed. The architects took great care to preserve the building’s historic character, while converting into a luxury hotel. No two rooms here are the same! Our room is a huge suite, with two sitting areas, a fireplace, a wet bar and a spa-like bathroom complete with enclosed rainfall shower, that creates its own steam room. 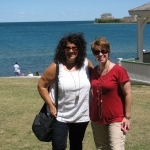 We set our up the Niagara River to the quaint town of Niagara on the Lake, a 30-minute drive. We had found a convenient map that indicated free parking zones. IN the middle of the historic district parking can be up to $2 an hour, but a couple blocks away on Byron Street, we found free, shaded parking. IN the same brochure, we found a self-guided walking tour with a great map and points of interest marked and explained. This was the route we chose to take, seeing the town at our own pace. We loved the St Mark’s Anglican Church and churchyard. 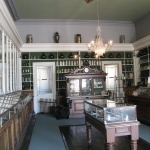 Which served as a hospital for the British early in the War of 1812, and then later, when the tide had turned in the war, barracks for American soldiers. Sadly, we learned that the church, and really the entire town had been burned by the US troops in 1813. Despite this, it was rebuilt and continues to have a very old-world feel to it. 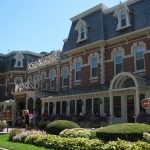 The historic district is full of flowers (LOTS of flowers), parks, shops, restaurants, and quaint inns and hotels. 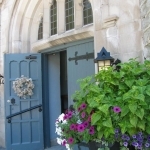 Horse drawn carriage rides are available, and you can also find Canada’s oldest continuously running inn just off Queen Street. 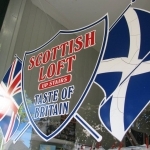 One of the shops caught our eye, being Anglophiles – the Scottish Loft. This little shop specializes in products from the UK, and the top floor is all thing Scottish – from pint glasses to kilts. We poked around in some of the shops during our walking tour and worked up an appetite. So, in keeping with the European feel of our day, we stopped into Nina’s to pick up some crepes, baguette sandwiches, and French pastries for lunch. 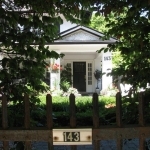 We got our items to go, and headed up King Street, which leads to a lovely park on the shore of Lake Ontario. There is a gazebo, picnic tables, a beach, and an awesome view of Toronto’s skyline. We sat down and enjoyed a picnic with a beautiful view of the blue (yes, blue) waters of the great lake. Tons of families were enjoying time lounging in the grass, playing on the beach, and picnicking. We headed out of the historic district into the countryside in search of the Neob Lavender farm. Our phone get service in Canada (we had to pay a small upcharge for the month – well worth it) so we planned to use that to navigate. But as we entered the countryside…no internet service! 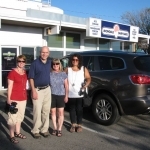 We had not had good luck with our GPS on the last trip to Canada, so we planned to rely on our phones for navigation. Oops. So we had a general idea where it was and went old school – paper maps and stopping to ask people! Finally, we found Neob. Melissa Achal met us in her shop and immediately her passion for lavender and natural products was evident. 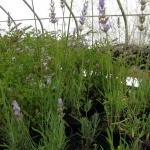 She had her husband began the farm and currently grow 2 types of lavender – one called Massuet they bred themselves, and is a blend of two other varieties – Grosso and Augustafolia. They also grow rose geraniums and lemongrass, and produce essential oile, sprays, and other products with these plants. Melissa took us on a tour of their greenhouse and garden, and shared about the growing process and the distilling process. Back in the shop, we learned about the various uses for lavender and the other plants – from medicinal uses to treat headaches and acne, and even hot flashes, to culinary uses in cookies and even sparkling water! We got to sample some of the products – the lavender shortbread, the lemongrass chocolate, and the lavender sparkling water were all delicious! Melissa and her staff go out of their way to help answer questions and make suggestions, helping each customer pick the perfect products. They even gift wrap with beautiful purple bows. The perfect stop! Next it was on to the Avondale Dairy Bar, which is very far out in the country away from “civilization.” It is literally in the backyard of the lavender farm – a large yard, about a 5 minute ride around the corner. 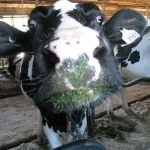 Donna, the owner’s wife took us back to see the dairy cows. In days gone by the farm, dairy, and ice cream shop had all been owned by the same people. Today, all three are run separately, yet cooperatively. 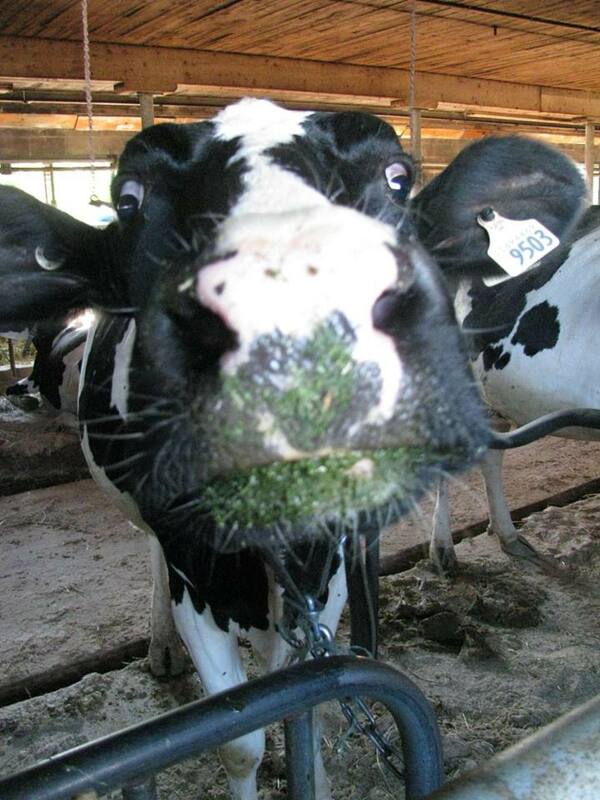 The cows were great – very excited to see visitors – probably hoping to get milked. Next, on to meet Ray and hear the story of the dairy bar. 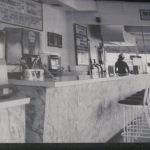 It opened its doors to selling its homemade ice cream in 1955, and the place has changed very little since then! They use all fresh local ingredients, and make all the ice cream on the premises – this is where Donna work. She makes the magic happen! Ray said that many generations come through here at all stages – from the grandfather whose parents brought him as a boy, to the new parents bring their kids to swing on the swings and enjoy the fields around them, this place is an icon of memories and tradition locally. Ray is very proud of the whole operation, and says the experience is a whole lot more than ice cream – it is nostalgia. Now, don’t get me wrong – the ice cream is amazing!!! I had the Death by Caffeine (of course something rich and decadent),and Courtney had the black cherry (of course something fruity). We went out to eat on the picnic tables next to the field. 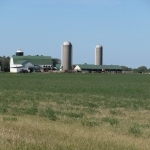 It was relaxing and fun to be out in the country – no traffic, and lots of corn and cows all around. I can certainly say that Avondale is worth the 20 minute drive! Once we left the peace and calm of the pastoral country outside Niagara on the Lake, it was time to return to neon city! 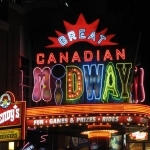 We had our Clifton Hill Fun Passes, and had three of our five venues left to enjoy! We decided on the Monster Blast ride in the Midway first. This was a ride through and shoot lasers at the glow in the dark spooks attraction. Reminded me a lot of the Buzz Lightyear ride at Disney! Next in the Midway was the Wild West “coaster.” This was a 6D simulation experience, complete with movement and wind! It was a blast. 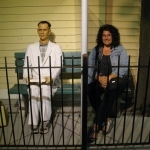 Last, I had always wanted to go in a wax museum as a kid, so I prevailed on Gail and Courtney to humor me. So as our final attraction we went through the Hollywood Wax Museum. Would have been upset if I had paid the $12 admission, but it was a fun thing to do as our final part of our Fun Pass. Also included on the passes were midway tokens so we could enjoy some of the arcade games. Heather enjoyed SkeeBall and I wacked a few sharks in the Wack a shark game. At the end of it all we had a fist full of tickets that we passed onto a sweet French Canadian family with several kiddos. It is always fun to pass it on!! Tomorrow we will have an adventure filled day with a trip to a local farm and the Whirlpool Jet Boat. Heather is apprehensive and I seriously can’t wait! Speed boats and white water… what could be better! Enjoying the journey surrounded by neon!